Docu-series “Black Love” highlights love stories from the Black community and seeks to answer the question, “What does it take to make a marriage work?” “Black Love” pulls back the curtain on how love begins while showing the reality of what life-long love looks like, and offers proof that while it can happen for everyone, it isn’t a cakewalk. The series shares jaw dropping, magical and sometimes cringe-worthy always-true love stories. 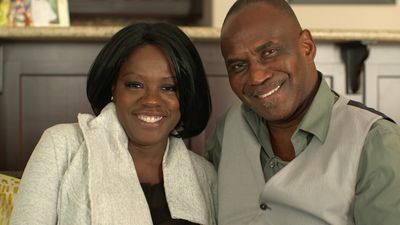 Featured couples include actress Viola Davis and husband Julius Tennon, actress Meagan Good and husband/producer DeVon Franklin, actress Tia Mowry and husband/actor Cory Hardrict, actor/comedian Flex Alexander and wife/singer Shanice, gospel singer Erica Campbell and husband and music producer Warryn Campbell, and many everyday couples from around the country. As newlyweds, filmmakers Codie and Tommy Oliver interview married couples to explore what makes a marriage work. Celebrity couples include actress Viola Davis and husband Julius Tennon, actress Tia Mowry and husband/actor Cory Hardrict, actress Meagan Good and husband/producer DeVon Franklin, actor/comedian Flex Alexander and wife/singer Shanice, actress Vanessa Bell-Calloway and husband Anthony Calloway, singer Erica Campbell and husband/producer Warryn Campbell, and producer/comedian Chris Spencer and wife Vanessa. The various couples describe the often-imperfect moment they entered each other’s lives. They describe in unique, relatable and surprising detail how their spouse went from being a stranger to their most beloved life partner and confidant.